Ford tractors have been around since the early 1900's. With their gear driven attachments and high horsepower, they perform jobs that exceed the capability of standard trucks. Their basic operation is different from a passenger vehicle in that Ford tractors have two gear levers, an engine stop control, and the throttle is controlled by a lever mounted next to the steering wheel. 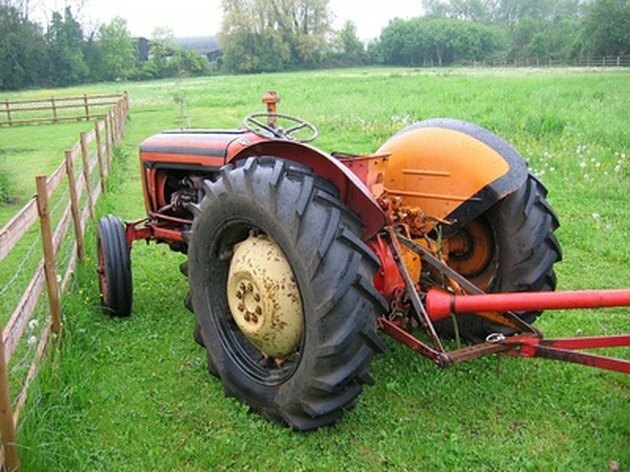 Ford tractors fill an important role in modern farming. Push in the engine stop control. Step on the clutch pedal and put the high/low gear lever in the neutral position. Pull the throttle control arm down halfway. Turn the key clockwise until the engine engages. Based in Orlando, Patrick McKinney started writing about musical instruments for eHow in 2011. His experience comes from owning FixitPat's Guitar Shop since 2002, which specializes in high-end repair and customization. Patrick holds an Associate of Arts degree in audio engineering from Full Sail Center for the Recording Arts. How Does a Ratchet Work?